What Roads Can cyclists Use? Question Jonathan asked: Which roads in Florida am I able to ride on, I know not i-4 or the interstates-75,90,10 and the turnpike’s, which others? Question Nathan asked: http://www.wekivaparkway.com/wpcms/data/img/uploads/files/23827525201-Signing.pdf Page 48 shows the sign, which will be posted on SR 46 (not a freeway). Page 18 shows the placement, used to get bikes to the right of a merging ramp. Is this legal? 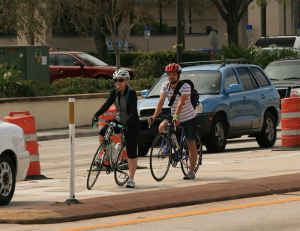 Question James asked: Is it illegal to ride a bicycle against the flow of traffic down a one-way street in Florida? Question Theresa asked: Do cycles need to stop before making right lane turn. On private property that has a stop sign. When a car is at the stop sign and cycles comes up on the car who has right way? Question Michele asked: Are bicyclists required to ride in the lane the same direction as the traffic or do they ride in the lane facing traffic as a pedestrian does?